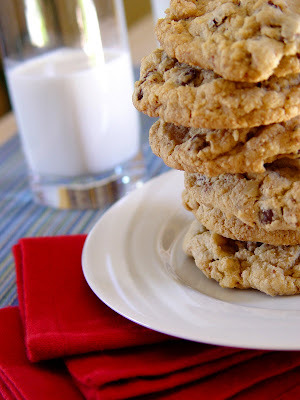 You’ve probably heard the urban legend about the woman who was so enraptured with the chocolate chip cookies at the Neiman Marcus Cafe that she asked for the recipe. She was told it would cost “two-fifty.” "Done!" went her inner thought bubble, and she eagerly agreed to let them charge "two-fifty" to her account. To her horror, when the bill arrived it was for “two hundred and fifty dollars!” Outraged, she decided to get even. She quickly dispersed the recipe to every one she knew and asked them to do the same. It turns out that the story isn’t at all true. Not even a little bit. It makes for a great tale though, and it’s still making the rounds in one form or another. Some versions would have you believe it was the Mrs. Field’s cookie recipe and in another, it's a red velvet fudge cake from the Waldorf Astoria. I love serving miniature versions of this cookie as dessert at dinner parties accompanied by shots of ice cold milk! Urban legend or not, this is truly the best chocolate chip cookie I have ever tasted. In an electric mixer fitted with a paddle attachment, cream together the butter and both sugars. Add the eggs and the vanilla, mix well to incorporate. Whisk the oatmeal, flour, salt, baking powder and baking soda together in a medium bowl and combine with the wet ingredients. Mix on low speed to form the dough. Fold in the chocolate chips, grated chocolate and walnuts by hand, so as not to break them up or melt the chocolate with the heat of the mixer. It takes a bit of elbow grease, but trust me, it is well worth the effort! Roll the dough into “golf ball” sized rounds and place 2 inches apart on a parchment lined sheet pan. Bake for 10 to 14 minutes until the top of the cookie cracks and turns golden brown. 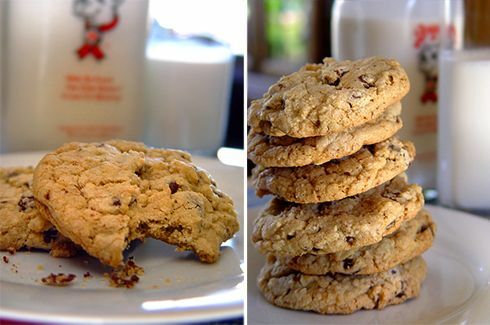 The key is to slightly “under bake” them so the cookie stays soft and chewy. Cool completely, (if you have that kind of willpower) on a cooling rack and store in an airtight container. * Measure the oatmeal first, then blend in a blender to a fine powder before adding to the other dry ingredients. 1. The pan matters. A good-quality, ovenproof nonstick skillet, about 9-inches in diameter with curved sides is perfect. 2. Never use more than 3 eggs in your omelette. If you’re feeding more than one person, make two omelettes! 3. You need patience to make a good omelette. You can’t rush perfection, so don’t try. 4. Season the omelette after you’ve cooked it, never before. The idea is that the outside be perfectly and beautifully yellow, unmarred by flecks of pepper and free of any brown spots. 6. 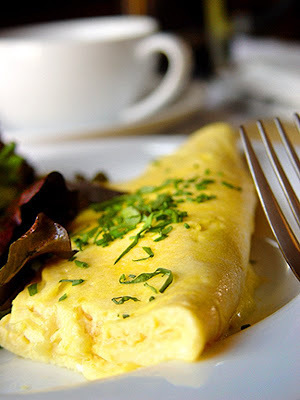 An omelette is a beautiful thing, perfect in its simplicity. It needs little more than a scattering of fresh herbs, none of that cheese and ham nonsense. And finally, Julia Child once said, "Wine is essential with anything! Particularly omelettes for lunch." Far be it for me to argue with a master. When the eggs begin to “just set” on the bottom (the top will still be wet) turn off the heat and toss the pan into the preheated oven. Let it go for about 1½ minutes until the top is still moist- looking and custard-like. Season with salt & pepper and scatter the chives and tarragon over the top of the eggs. Using the rubber spatula, gently loosen the edge of the eggs from the side of the pan and fold one side over toward the center. Use the pan to help you invert the omelette onto a plate folded over itself in thirds. Perfection! I feel quite confident proclaiming these to be the best scones I’ve ever tasted. That sentiment has been echoed by everyone who has ever had the pleasure of tasting them still warm from the oven and drizzled with sweet, sticky glaze. They capitalize on the “made for each other” combination of blueberry and lemon and require (in my opinion) no further embellishment of butter, Devonshire cream or jam, but feel free to slather on as you see fit. I promise you, these are nothing like the heavy, dry and crumbly scones that may have turned you off in the past. I may run the risk of overusing the adjective “light,” in this blog, (light in texture mind you, not in calories!) but that’s exactly what they are. There simply is no other word. The secret to that dreamy lightness lies, of course, in taking extreme care not to overwork or over bake the dough. Line a sheet pan with parchment paper and set aside. Meanwhile, in a large bowl whisk together the flour, sugar, baking powder, salt and lemon zest. Add the butter and work it into the flour mixture with a pastry cutter or by pressing it between your fingers until the mixture resembles coarse meal and the butter is about the size of peas. Using your fingers, gently toss the blueberries with the flour mixture. At this point I usually place bowl back into the refrigerator to keep the butter cold while I whisk together the cream and the eggs. Make a well in the center of the flour mixture and pour in the eggs and cream. Using the tines of the fork and working from the outside of the flour mixture, gently start incorporating the dry ingredients into the wet until just combined being careful not to mash the berries. The key is not to overwork the dough, but to just bring it together. It will be crumbly, but that’s exactly what makes a moist, tender scone in the end. Lightly dust your work surface with flour and turn the dough out onto it. Gently knead the dough and pat it out into a 6-inch rectangle. Using a knife or a pastry bench scraper, cut the dough into 4 equal squares. Cut each square in half on the diagonal to make eight triangles. Carefully transfer the scones to the prepared sheet pans. Brush tops with remaining cream. Bake until lightly golden brown and firm to the touch, about 15 to 18 minutes. Meanwhile, to make the glaze, mix the lemon juice and confectioners' sugar together in a microwave-safe bowl (I use a Pyrex glass measuring cup). Stir until the sugar dissolves. Add the lemon zest and butter. Nuke it for 30 seconds on high. Whisk the glaze to smooth out any lumps. Cool the scones slightly on a wire rack then drizzle artfully over the top of the warm scones. Genius! 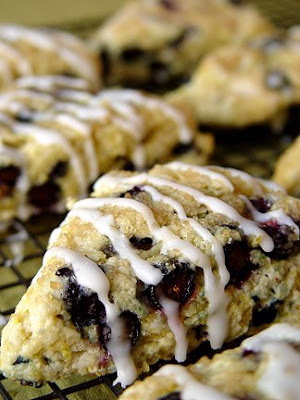 VARITAION: To make Cinnamon Chocolate Scones, substitute 2 teaspoons ground cinnamon in place of the lemon zest and 1½ cups chopped bittersweet chocolate chunks for the fresh blueberries. I have a fondness for retro kitsch in the kitchen. Spaghetti alla Carbonara was big in the 70’s, but like so many food trends of that decade, it seems to have vanished from the collective consciousness. Fondue, anyone? I think it’s time for a reissue of this simple classic. By simple I mean its preparation, not its flavor. 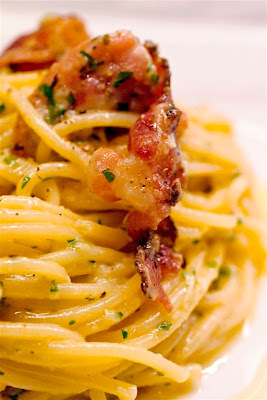 There are several theories on the origin of Spaghetti alla Carbonara, which loosely translated means, “in the manner of coal miners, ” or "coal miner's spaghetti." It’s rumored that the dish was created during World War II by the Italians when American servicemen were hungry for bacon and eggs. My favorite legend however, claims that it was a staple of the coal miner diet because its few and simple ingredients could easily be carried into the mines and they needed no refrigeration. A roaring campfire was all that was needed for a quick meal. The liberal use of black pepper in the dish is said to represent the flecks of coal that would fall onto the miner’s plates. Isn’t that a romantic notion? 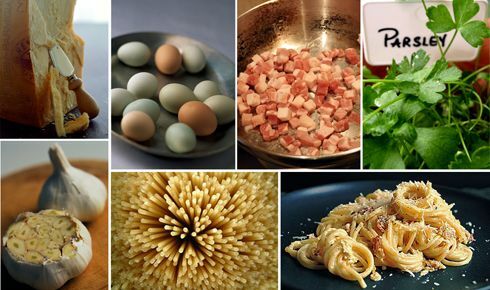 The ingredients for spaghetti alla carbonara. Bring a large pot of water to the boil and when it does, generously season the water with salt. Cook the spaghetti according to package directions, to al dente, about 12 minutes. Reserve a ¼ cup of the pasta cooking water. Meanwhile, with the flat side of a butcher knife, smash the garlic cloves and place them in a medium sauté pan along with the olive oil over medium-high heat. Saute until the garlic turns golden, about 2 minutes. Remove the garlic and discard. Place the pancetta in the pan and cook until it begins to crisp around the edges, about 5 minutes. Add the wine and let the alcohol cook off, about 1 minute. Remove from the heat. Meanwhile, crack the eggs into the bowl in which you’ll be serving the pasta. Beat them lightly with a fork and slowly whisk in the reserved pasta water. Add the cheeses and a generous grinding of black pepper, along with the parsley. Mix well. Drain the spaghetti and immediately add to the bowl. Tip the pancetta into the bowl and toss well to coat. Serve immediately. * If you’re concerned about using raw eggs, substitute ½ cup of pasteurized egg product for two large eggs. As a born and bred Californian, I’m understandably cautious about tackling the subject of the New York Egg Cream. It’s not my drink, geographically speaking, and there are many hotly debated theories on the correct way to go about making one. Do you add the chocolate syrup first, or drizzle it in after the cream? What exactly is the correct ratio of cream to seltzer? I for one will take an egg cream any way I can get it. It’s the perfect concoction for a hot summer day, cool and creamy, bubbly and sweet. I’m claiming no authenticity here with this recipe and I admit I have only been to New York a large handful of times. Therefore, I am completely reliant on the childhood memories of a friend of mine who grew up on Long Island. He tells me there are three indelible truths when it comes to making the perfect egg cream. 1.) If at all possible, you must use Fox’s U-Bet chocolate syrup. I am told there simply is no substitute. But just between you and me, I’ve used Hershey’s and it’s delicious. 2.) Heavy cream is better than milk. I can’t tell you exactly why, but I suspect it’s because it adds an extra richness to the drink. 3.) You must use ice-cold seltzer water. Apparently, club soda would be blasphemous. I have come to accept these things as the iron-clad rules of egg cream making for two reasons: It tastes great and my friend has a rather intimidating cousin named Vinny, who says that’s just the way it is. I do what I’m told. In a tall glass, layer the chocolate syrup and the heavy cream. Pour the seltzer water over and stir vigorously. Fugedaboutit!! I am evangelical about grilling in the summer! Any time of year for that matter, but there’s just something about cooking dinner outside, over an open flame on those sultry summer nights that speaks to me. That said I'm always interested in recipes and methods that not only make grilling easier, but more delicious. In the last couple of years I’ve become quite a fan of grilling on natural red cedar planks. The method produces in the salmon an intoxicating aroma, beautiful texture and a smoky flavor from the cedar that subtly perfumes the fish. While I admit I’m not charting any new territory here, it’s a method that’s been around forever and one that most people have heard of, it’s surprising to me just how many people haven’t actually tried grilling on cedar for themselves. I’m on a mission to change that! If you find yourself hesitant or think the technique requires some sort of grilling super powers, let me assure you it’s no more difficult a proposition than getting yourselves some cedar planks, giving them a good soak in water for a few hours before grilling and whipping up a sweet-hot and deliciously sticky glaze that shellacs the outside of the salmon beautifully while maintaining its meltingly coral pinkiness on the inside. The cedar planks themselves are inexpensive and easily found at any well-stocked grocery store, hardware stores and of course online. Amazon has several options available that can be delivered right to your door. ▪ Weigh the planks down while they’re soaking using something like a can or two from the pantry. The planks are buoyant and you want to ensure they’re good and water logged. 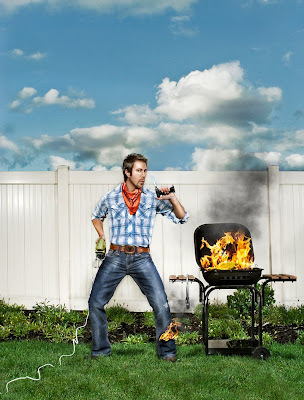 ▪ Keep a spray bottle of water near the grill to extinguish any flare ups. ▪ What ever you do, don’t overcook the fish! Perfectly cooked salmon should still have a bit of a pink trail running through the middle of it. Cook until the internal temperature reaches 135 degrees F. on an instant read thermometer. ▪ Let the salmon rest for 5 minutes or so loosely tented under some aluminum foil before digging in. ▪ Don’t even bother with a serving platter. 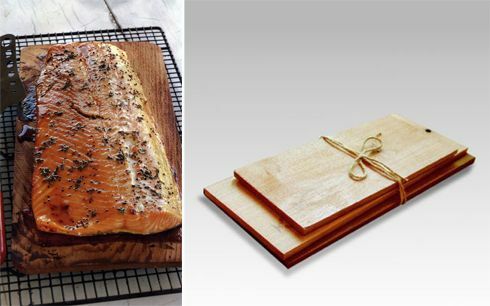 The cedar plank makes a rustic and easy presentation without any extra clean up. 1 cedar plank, about 10 x 16 x ½-inch thick, soaked in water for 3 hours. To make the glaze, sauté the ginger in the oil for about 30 seconds in a medium saucepan set over medium heat. Add the garlic and sauté for 30 seconds more. Add the orange juice, honey, tobacco, brown sugar, orange and lemon zests and pepper. Let the glaze simmer and reduce over low heat until it 2/3 evaporated and takes on thick, syrupy consistency. Remove from the heat and let cool to room temperature. Stir in the cilantro. Oil the skin side of the salmon and generously season with salt and pepper on both sides. Lay the salmon skin side down on the cedar plank. Place the plank with the salmon onto the grill and close the lid. Let cook for about 5 minutes before painting the salmon with the glaze. Continue to baste every 5 minutes or so until the salmon is done, about 18 to 24 minutes total, depending on the thickness of the filet. The internal temperature should read 135 degrees F. Transfer the salmon and plank to a platter and serve right off the plank. I have a secret I’m dying to let you in on just in time for Memorial Day weekend. Like any juicy tidbit, it won’t be a secret for long. As a cultural explorer and culinary sleuth, I am always on the lookout for exciting developments and the “next big thing” on the food and wine horizon. I believe I’ve found it. Are you ready? Lean closer … it’s sparkling Shiraz, or “spurgles,” as the Aussies fondly refer to it. Many of you are probably no stranger to Shiraz, the spirited, fruity red that has become synonymous with Australian wine and a favorite among wine aficionados. But the sparklers stand on their own. Think bold and inky, a spicy, fruity depth with bubbles! Lots of bubbles. The color is glorious, too! The wine is best served chilled, in champagne flutes, and pairs beautifully with spicy and grilled foods. It’s perfect for summer barbecues or with your favorite spicy Thai food. But unlike champagne, which is often made with Pinot Noir grapes but remains pale because of its minimal contact with the red skins, sparkling Shiraz is vinified with the skins, resulting in a deep, crimson color and alluring aroma. I must tell you this is not—I repeat, not—Cold Duck! Cold Duck is a carbonated sweet wine `from the ’70’s that bears more of a resemblance to grape soda pop than to fine wine. While I’m always up for a bit of retro chic, some things are best left in the past. Polyester leisure suits, anyone? The Australians have been enjoying sparkling reds for years. Only now is their best-kept secret gaining popularity in the United States. Vintage sparklers are typically aged for five to 10 years, and are done in small quantities. For those reasons, they can be a bit of a challenge to find. My first excursion turned into an all-day outing that finally produced a bottle of Majella 2002 sparkling Shiraz from a local wine shop. Many shopkeepers along the way cocked their heads in an RCA Victor–dog sort of way and looked at me curiously when I inquired about the bubbly red. I nearly wept with joy when I finally found it, and carried it home like the Holy Grail and placed it in my refrigerator with eager anticipation to chill for that night’s dinner. As I sat down to grilled steak and spicy roasted vegetables and popped the cork, I must admit, I was skeptical at first. I poured the wine into a tall champagne flute. The color was deep, dark purple and the bubbles a beautiful, rich shade of pink. I sniffed. It had a warm, fruity aroma. Not knowing quite what to expect, I took a sip. I was hooked! It was drier than I had expected. I took another sip. I was in love! The lush fruitiness and unobtrusive tannins were in perfect harmony. And those bubbles! Dancing in my mouth, they were perfect with the grilled steak and peppery vegetables. It all came together in that moment. I went out the next day and bought two more bottles. A week later I ordered a case and invited 10 friends to dinner to share my new discovery. 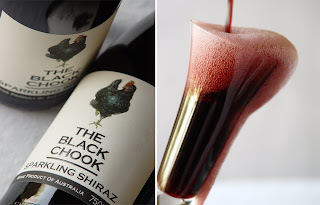 In my search for the perfect sparkling Shiraz, I found many that I liked (some better than others, but they all had something distinct to offer). As I mentioned, they’re not always easy to find, being that we’re just starting to catch on stateside. But I did find one amazing resource called the Jug Shop in San Francisco with several varieties in stock. In fact, they boast the largest selection of Australian wine on the West Coast, and were voted one of the top 10 specialty wine stores in the U.S. by GQ. They are friendly and knowledgeable, and their motto is: “We taste bad wines so you don’t have to.” The good news is, even if you don’t live in San Francisco, they have an easy-to-navigate Web site, http://www.jugshop.com/, and they ship anywhere in the U.S. Now that my fizzy little secret is out, you’ll know what to look for when searching for the perfect wine to serve at your next barbecue. Just what you grill may be up for debate, but the wine selection is clear. Fire up the grill! THE GRILL OF IT ALL! The all-American Hamburger gets a gourmet makeover with the addition of ground brisket and a few other ingredients that really take this cookout classic to the next level. Perfect for Memorial Day! Admittedly there's a bit of preparation involved, but don't confuse time consuming with difficult. There's nothing difficult about these burgers and most of the prep work can be done days in advance. Believe me, the flavor pay off is well worth it! Ask your friendly butcher to grind the brisket twice for the juiciest, most delicious burger you've ever tasted. *Dried, smoked jalapenos in a spicy tomato sauce called adobo; available on the International aisle of most supermarkets and in Latin markets. 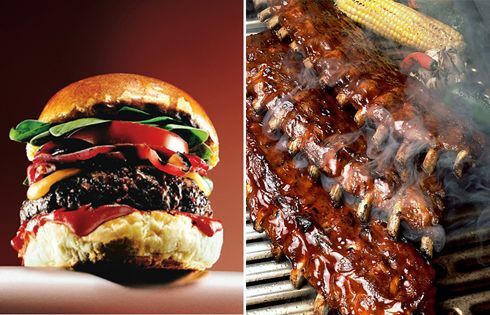 This is the ONLY rib recipe you will ever need. Sticky and sweet. Absolute perfection! In the summer when tomatoes are at their peak, they’re made even better when introduced to the blistering heat of the grill and paired with the pungent sharpness of feta cheese. This dish is great at room temperature. Preheat an outdoor grill or indoor grill pan over high heat. In a food processor, puree the feta, sour cream, water, lemon juice, and garlic until smooth. With the motor running, add 1½ tablespoons oil in a slow stream. Add basil and salt and pepper; pulse briefly to combine. Thinly slice the zucchini lengthwise (a little over 1/8-inch thick) using a vegetable peeler. 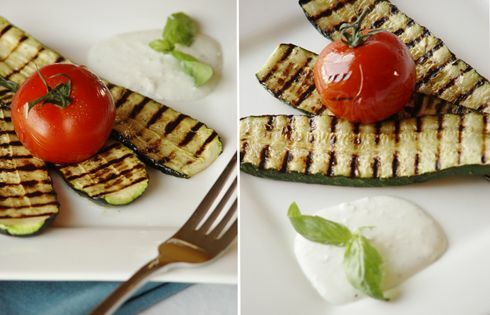 Toss the zucchini with the tomatoes in a large bowl with the remaining oil and season with salt and pepper. If using loose tomatoes, thread onto skewers. Grill, turning once with tongs, until vegetables are just tender (about 3 to 5 minutes) and have those beautiful grill marks. Serve with feta sauce on the side. Okay... here it is! My very own food blog in my very own corner of the blogosphere! People have been asking me to do one. My manager (or MOMager, as she's affectionately known) has insisted that I do one. Even my neighbor looked at me as if I had two heads when I fessed up to my all too obvious blogging deficiency. Quite frankly I was beginning to feel like a bit of a social loser for not having one! Then came my undoing: "Blogs Are The New Black!" screamed the headline of one recent magazine article. How could I ignore such a powerful sentiment? I defiantly stared at that article every day for a week, refusing to throw it out as if my standoff with a magazine would somehow teach it a lesson, or change its content or diminish the undeniable truth of its message. Finally, after much resistance, I took it as a sign and made peace with the fact that I was going to write a blog. Namaste. But seriously, more than that, I just couldn’t take the pressure! But the more I thought about this whole thing and the more I started checking out other people's blogs, the more it was beginning to make sense. A light bulb went on, albeit a dim one at first, but it got me thinking about all the reasons that I should blog, or rather, why I’d LIKE to blog and while I won’t bore you with that entire list, I will tell you that reason #3: Write what you know, #10: A great way to connect with other "foodies" all over the world and exchange recipes and ideas, and #22: Maybe even road test and get feedback on a few things for my next cookbook, were reason enough for me to start my own blog. So with much prodding (i.e., nagging) and encouragement, I've finally succumbed to the pressure and created Forking Delicious! Welcome! For what it's worth, that was reason #1!